Synopsis: Poetry. 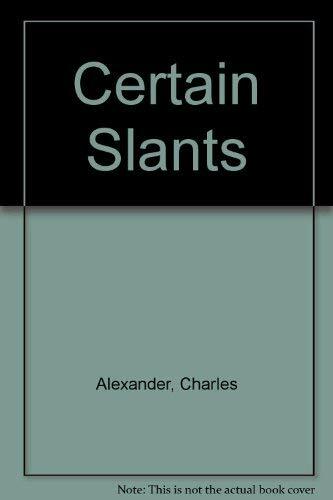 Charles Alexander in his new collection of poetry, CERTAIN SLANTS, "...gives us certain slants, various slants, oblique angles into this world, poems written with considerable grace, integrity, and a tentativeness that becomes an ethical gold standard..."--Hank Lazer. "In this oblique exploration of natural history, Charles Alexander brings us the world as an intimate game, a peaking throug hwater. He manages to make autobiography universal and the great outdoors deeply private, and all through his love of language..."--Cole Swensen.